A rather unassuming weedy plant, galinsoga (Galinsoga parviflora) often comes and goes in the garden without really being noticed at first. Easy to pull due to its shallow root system, the plant doesn’t have big flowers or nasty prickles or spreading rhizomes or tangling tendencies. Ask a farmer about galinsoga, though, and you’ll get an earful about what a nuisance it can be. Galinsoga comes up in early summer, and if left unpulled, it has the ability to produce multiple generations until the first frost. It’s tempting to add the plants to your compost pile as you weed—its juicy, nitrogen-rich biomass breaks down easily and seems like a gift of greens. But alas, if you do, you’ll see the effects of one of galinsoga’s most effective survival strategies. Those tiny flower clusters—five 3-toothed white petals around a yellow center—produce a plethora of seeds that mature almost immediately. So the common weed management strategy of pulling before the flowers fade and the seeds have set doesn’t work here. As soon as the plant has flowered, it’s already on its way to producing the next round of baby galinsogas. This is not necessarily a negative characteristic. In its native South America, galinsoga’s prolific reproduction and ease of “harvesting” make it a desirable culinary crop. The plant is known as guasca in Colombia and is the main herb in a garlicky soup called ajiaco. 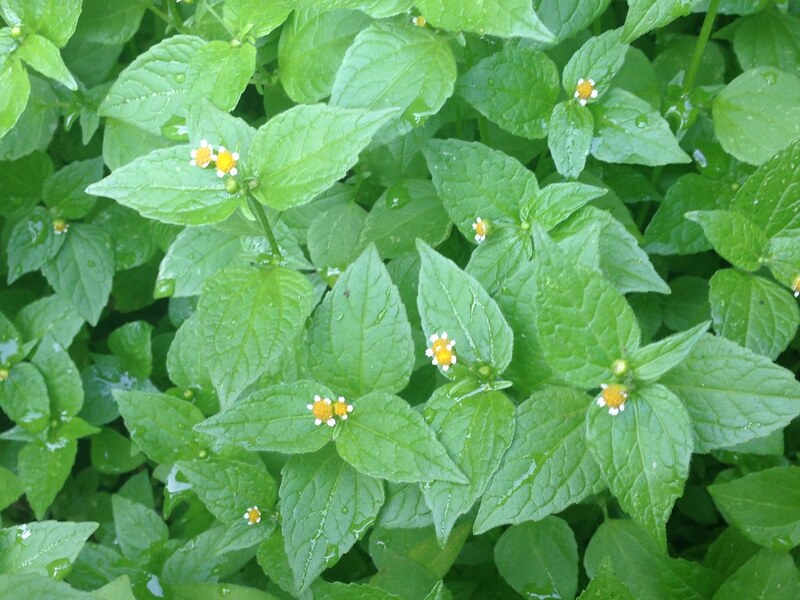 It eventually was introduced to the old world, but Europeans passed on eating it, and it became a minor weed. After making it to China, though, it found its way back into stews and soups. I can attest that the toothed, fuzzy leaves themselves don’t have much flavor, but the plant certainly adds nutrition and bulk to any dish. 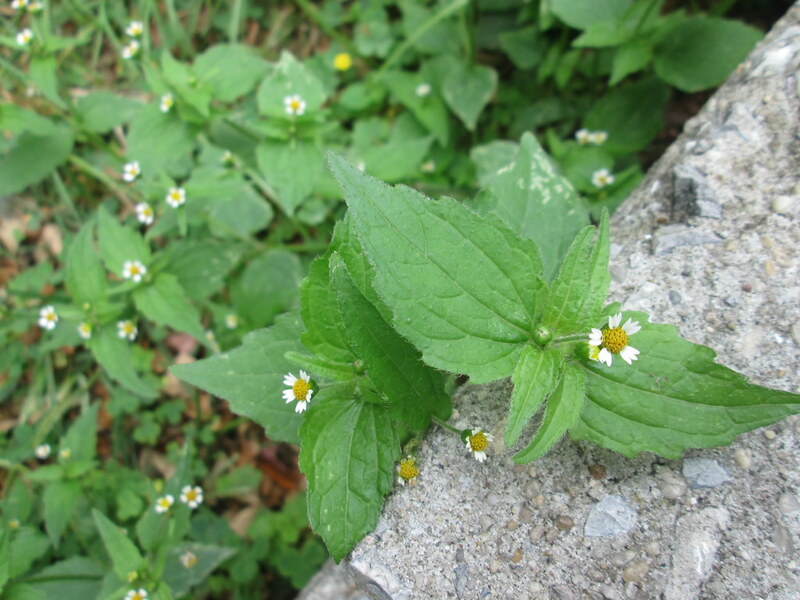 Galinsoga also has some medicinal uses as a topical treatment for nettle stings and for coagulating blood in minor cuts. Galinsoga derives its name from the 18th-century Spanish physician and botanist Ignacio Mariano Martinez de Galinsoga. He founded the Real Academia Nacional de Medicina and was a director of the botanic garden in Madrid. Why would a medical doctor direct a botanic garden? Though Western medicine may not focus much on the medicinal power of plants today, for centuries those who studied medicine also studied plants. Over time, English speakers referring to the plant muddled Dr. Galinsoga’s name until the common name “gallant soldier” emerged. Much more recently, the kids in BBG’s Children’s Garden have garbled it even more. There it is known as “gallon of soda.” Whatever you call it, try to appreciate this diminutive aster. Its fast-paced reproductive ability assures that it’s here to stay. Actually, its leaves are tasty though they need to be dried at a certain temperature to activate its taste that reminds you of artichoke. So it’s usually dried in the oven at 40C/104F for about 1/2 hour or when it starts to broken in your hands. It means it’s used as a herbal seasoning after pulverizing it with your hand. It goes well with light dishes like creamy soups, white rice, mashed potatoes, omelettes, fried eggs, boiled eggs, scrambled eggs, eggplant, consommés, etc. Thanks for this article. My mother made a delicious Colombian soup, ajiaco, with this herb from our garden. Do you know where I can get these seeds (or a starter plant) for my garden? Thank you very much! When I moved to the mountains of western North Carolina almost 40 years ago, I was introduced to galinsoga as “devil in the garden,” and I’ve been calling it that ever since. Great to know about the reproductive speed of the flowers. I will try to identify it earlier. I used to depend on spotting the flowers. I’m not moved to eat it, even after your recommendation. Glad our community garden head gardener passed this link to us. Galinsoga parviflora . Photo by Saara Nafici.